A supplement with no competition – harnessing the benefits of PURE resveratrol and Alpha Lipoic Acid. We developed the Resveratrol & Alpha lipoic acid capsules due to the demand we had from consumers, who would like to fight ageing and also enjoy the myriad benefits of Resveratrol. Please take note that we use 99% pure Resveratrol in our Resveratrol & Alpha Lipoic Acid capsules – and not 10% Resveratrol that so many other manufacturers use – as we only produce high quality formulations. Ageing is associated with an overall loss of function of the whole organism, which starts at cellular deterioration. All the components in the cell require continuous recycling and regeneration throughout the lifespan of the cell – and should damage occur – especially in the mitochondria of the cell – which is very susceptible to damage – it will result in it ageing and in the degeneration of the cell. The mitochondria in the cell are most susceptible to damage as they are the major bioenergetic machinery and source of oxidative stress in cells. In ageing and in diseases associated with ageing – such as Alzheimer’s and Parkinson’s, the loss of cells in the vital organs may be related to several factors – and one of the primary factors would be the production of reactive oxygen species (also known as free radicals) (ROS) by the mitochondria in the cell – which leads to DNA damage and cell death – and by extension to ageing. It is therefore imperative to look at effectively controlling the mitochondrial biogenesis and turnover – and for the maintenance of energy production in the cell – and preventing oxidative stress of the mitochondria – which will in turn promote healthy ageing. The compound – t-RESV – found in resveratrol displays a number of biological activities including anti-inflammatory, antioxidant, platelet anti-aggregatory and anti-carcinogenic properties as well as the modulation of lipoprotein metabolism – and all of this can have an impact on lifespan extension. It has been shown that t-RESV is a potent activator of sirtuin enzymatic activity which mimics the beneficial effects of caloric restriction (CR) diet which has been shown to retard the ageing process and increase longevity. Apart from this the t-RESV also seems to be effective in delaying the onset of a variety of age-related diseases in mammals and therefore shows great potential as an effective anti-ageing compound. Resveratrol is a phytoalexin which has been reported to slow ageing by acting as a sirtuin activator and also has a wide variety of pharmacological effects on adipocytes (fat cells) and may help to alter fat mass by directly affecting cell viability and adipogenesis in maturing preadipocytes. The sirtuin genes function as an anti-ageing gene in yeast and the NAD requirement for sirtuin function indicates a link between ageing and metabolism and a boost of the sirtuin activity may in part explain how calorie restriction extends life span. In some tests resveratrol showed great promise to help with this and the acknowledged SIRT1 activator – resveratrol – has been shown to stimulate mitochondrial biogenesis and deliver health benefits in treated mice. It is this mitochondrial biogenesis that may have beneficial effects on ageing and also perhaps prevent the diseases normally associated in ageing. SIRT1-mediated mitochondrial biogenesis may also reduce the production of reactive oxygen species (ROS) which has a strong link to ageing. UV radiation and H(2)O(2) are two major inducers of skin cell damage – but resveratrol has been shown to down-regulate SIRT1 in a time and dose dependent manner and act as an effective antioxidant – protecting against both UV- and H(2)O(2) induced cell death – making resveratrol a powerful compound to use in the fight against skin ageing. In a study where cigarette smoke-induced vascular oxidative stress and inflammation was used to measure the effectiveness of resveratrol it was shown that resveratrol can also help protect against cell death caused by cigarette smoking. PLEASE NOTE – this was an animal study and we are not advocating that you smoke cigarettes and then use resveratrol to protect your lungs and arteries – but it is non the less an interesting study. Some data on resveratrol is also compelling in the area of skin cancer prevention and resveratrol even helps with problems not noted before – such as urinary bladder dysfunction. Collagen is a protein and is found in all body parts including the largest organ of the body – the skin – and is made up of three strands of repeating amino acids coils coiling into the unique collagen triple helix. Various types of collagen are found in the body and are required to build new cellular structures – like skin – and to repair any damage caused. Types I, III and V are specific collagen types involved in the health of your skin. Together with soft keratin, the collagen and elastin fibers are responsible for the strength and elasticity of the skin – and degradation of the collagen leads to ageing and accompanying wrinkles. What damages and destroys collagen? With the onslaught of normal ageing the collagen in our skin is under attack and various factors hasten the degradation of collagen. Sun tanning and sun exposure is one of the main culprits of collagen deterioration in our skin and inflammation also destroys collagen. Large amounts of free radicals – which are formed during normal body functions (oxidation) can also destroy collagen – and here a person can specifically look at pollution and toxins in your environment: a fat filled diet as well as cigarette smoking and consuming alcohol. Although a Finnish study could not detect morphological changes in the skin of smokers they did find that type I and III collagen synthesis is decreased and that the regulation of ECM turnover is altered in smokers – which may lead to deterioration of the tensile strength and resiliency of skin in the long term. Alpha lipoic acid (also known as thioctic acid and 12-dithione-3-pentanoic acid) is a sulfur containing antioxidant and is active in both lipid (fats – such as the cell membrane) and aqueous (water – as found inside the cell) environments and helps to increase the production of glutathione and assists vitamin C and E and helps to get rid of toxic substances in the liver. Notwithstanding the fact that alpha lipoic acid has been around for a long time it plays two very important roles in the cell. A lot of people think that Dr. Perricone discovered alpha lipoic acid – but it was already discovered in the 1950’s. Firstly it is a fundamental co-enzyme in two vital reactions that lead to the production of energy at cellular level. Secondly it is a powerful antioxidant that is active against a broad spectrum of free radicals in both aqueous as well as lipid surroundings and due to its size it can access nearly the entire body. Although it may not sound important, it is vital to note that alpha lipoic acid is active in both water and lipid environments since the human cell consists of various parts and these parts are either water or lipid based – this particular ingredient can work in both to protect against free radical damage. It is readily transported through cellular membranes and helps to recycle other antioxidants – when vitamin E for instance quenches lipid peroxidation and a vitamin E radical is formed, alpha lipoic acid will reduce it back to the active state of vitamin E.
The same reaction occurs in the presence of the anti-oxidant vitamin C. If the concentration and presence of free radicals can be contained within the cell far less oxidative stress and damage will be caused. This will result in ageing being retarded at cellular level as oxidative stress is one of the leading causes of ageing. Apart from fighting oxidative stress and reducing free radicals and their damage, alpha lipoic acid can also help boost the level of intracellular glutathione – which is another antioxidant that is very important to the immune system. It furthermore helps to fight inflammation as well as edema (water retention) caused by such inflammation. Alpha lipoic acid helps to combat inflammation since it prevents the activation of NFk-B which in turn prevents pro-inflammatory chemicals – called cytokines – from being formed. The transcription factor – AP-1 – is also activated in a healing manner by alpha lipoic acid. When AP-1 is activated by sunlight it starts to produce collagen-digesting enzymes called metalloproteinases, but when so activated by alpha lipoic acid it actually destroys damaged collagen. It also helps with the prevention of glycation – where sugar and the protein of the collagen are cross-linked leading to stiffness, wrinkles, lines and ageing of the skin. Alpha lipoic acid occurs naturally in foods and can be found in liver and kidneys, while spinach, broccoli, tomatoes, garden peas, Brussels sprouts and rice bran also provide alpha lipoic acid. The body is able to manufacture its own alpha lipoic acid, yet this production reduces with age and extra alpha lipoic acid is then required by either diet or supplementation. It easily crosses cell membranes and protects the cells by killing off free radicals and works inside and outside the cell and is able to cross the blood brain barrier. It chelates metals (binding to the metal and thereby rendering dangerous metals inactive), reduces inflammation and increases acetylcholine (Ach) and also regenerates itself. To have unwanted metals in the body can cause Reactive Nitrogen Species (RNS), which also places stress on the cell and promotes premature cell ageing. By chelating (binding) the metal to it it stops the negative effect the metals would normally have. The free radical “Reactive Oxygen Species” (ROS) (including oxygen ions peroxides and free radicals) can result in cell death by starting a chain reaction that damages the cell membranes, mitochondria, lipids and proteins. Alpha lipoic acid also has a positive influence on diabetic patients and in Germany it is approved for the treatment of diabetic neuropathies (nerve damage). Diabetic patients also suffer from oxidative stress leading to cell damage (more free radicals) and here alpha lipoic acid is of value. It also has value in enhancing insulin functions. Alpha lipoic acid has a role to play in protecting the brain and assisting with the control of degenerative neurological diseases, such as Alzheimer’s, Parkinson’s and other prion diseases, as oxidative stress from excessive free radicals are always present in these degenerative brain diseases. 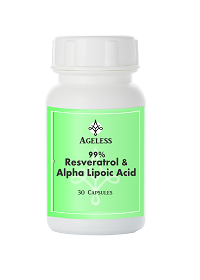 Since alpha lipoic acid neutralizes free radicals, long term supplementation may be of help. Peripheral neuropathy (damage to the nerves) which can manifest as weakness, sensory loss or pain, loss of muscle bulk, twitching, numbness, cramps, spasms or tingling – can also benefit from alpha lipoic acid supplementation. This condition can be caused by various factors and includes diabetes, excessive alcohol use, malnutrition, vitamin deficiency, thyroid and pituitary problems, AIDS and certain drugs (including antiretroviral drugs), chemotherapy, cholesterol lowering drugs etc. Retinitis pigmentosa is a genetic eye disorder that leads to incurable blindness and is a type of retinal dystrophy (degeneration) and severe tunnel vision is normally followed by blindness. Although some people suffering from RP retain some sight, many are classified as legally blind in their 40s and 50s. In a study it was shown that alpha lipoic acid can be of benefit to people with inherited RP, due to the fact that it helps to reduce rod and cone death in the eye with its antioxidant function, thereby being a valuable compound to look at if you suffer with this disease. Faulty antioxidant defense in the eye can also contribute to cataracts and glaucoma (increased fluid pressure in the eye that causes irreversible damage to the optic nerve). Alpha lipoic acid enters the eye via the lens and is converted to DHLA and with various pathways helps vitamin E and C as well as glutathione to penetrate. It shows great promise to help prevent cataracts, plus the fact that it binds with metals (chelate) is of benefit when fighting cataracts. In a Russian study it was found that supplementation with alpha lipoic acid is also of value in fighting glaucoma. Although this may not be a serious “disease”, skin ageing is caused by internal and external factors. Both these factors cause cell damage which is still the leading cause of skin ageing. External skin ageing is caused by sun exposure, air pollution, cigarette smoking, alcohol abuse, poor nutrition and bad skin care. Internal ageing is dependent on the normal ageing process (caused by free radicals) a reduction in growth factor and hormone activity, as well as inherited genetic pre-disposition to premature ageing, which will show as thinning skin, skin slackness as well as lines and wrinkles. One of the biggest external contributing factors to skin ageing is sun exposure – direct or indirect sun – and the UV radiation of the sun causes an inflammatory condition in the skin and a massive release in free radicals, which leads to premature ageing. It was shown that supplementation with alpha lipoic acid has a very positive role in helping to prevent this type of ageing. Glycation – the bonding of a sugar molecule with a protein or fat molecule is also a major factor in skin ageing – you can compare it to making caramel by warming sugar in a pan. In a study alpha lipoic acid showed that it helps to prevent glycation in skin cells and thereby preventing collagen (the building block of your skin) abnormalities. In various studies it was shown that supplementation with alpha lipoic acid can positively benefit the fight against ageing in general, due to its extremely potent antioxidant properties and various ways in which it positively influences the health of cells in general. Take one(1) Resveratrol & Alpha Lipoic Acid capsule once daily or as directed by a healthcare practioner.